This fun Web site is part of OLogy, where kids can collect virtual trading cards and create projects with them. Here, they learn about paleontology with a hands-on activity. The activity opens with an explanation covering how fossilized bones are usually very delicate and buried deeply in rock fossils. 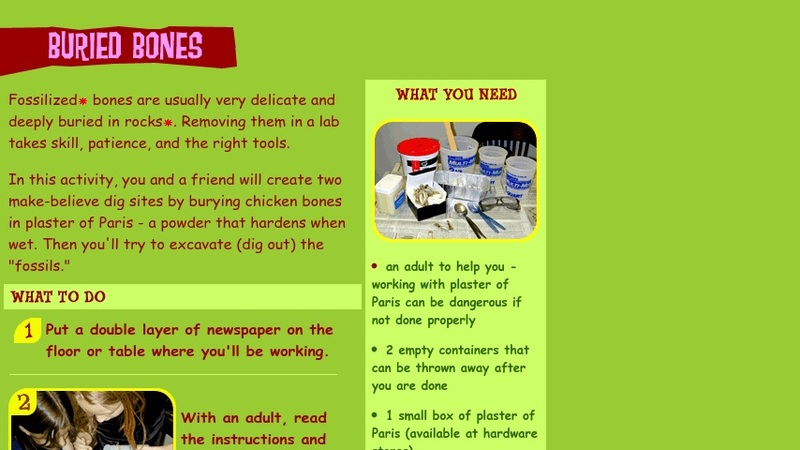 Students are then given step-by-step directions for working with a friend to create two make-believe dig sites by burying bones in plaster of Paris. The activity ends with three discussion questions: What was surprising about excavating the bones? What strategies did you find worked well for removing the plaster? How would you have worked differently if you had no idea what was buried inside? Adult supervision is recommended.